There are loads of things that the older generation doesn't understand about us whippersnappers, but Facebook isn't one of them. The following photos were posted on a Reddit thread that shows what the elderly have been up to on the popular social media platform. In fact, many of them are totally confused about how the whole thing works. But it makes us love the elderly even more because they're so adorable as they try to figure out how this confusingly technological world works. This leads to a lot of confusion, antics, and misunderstandings that will have you laughing. After you read this, you'll probably want to reach for your phone and call your grandparents. But you should try messaging them on Facebook. It's ten times more delightful. 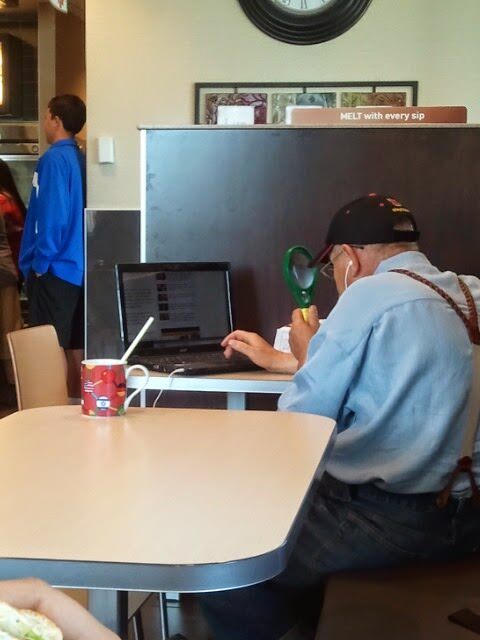 This gentleman was at McDonalds checking out his Facebook and had a hard time seeing the screen. Isn't he adorable? Why didn't anyone explain to him that you can use the zoom feature to magnify. This granny has big news to report on social media, and it involves some delicious brownies! Reddit's [email protected] is excited, but all her friends care about is this guy named Michael! Sometimes what old folks type online can make perfect sense to them in their heads at least. It only takes a second for someone to misunderstand the meaning. Yellow things...hmm...Most parents mistakenly assume that they can be perfectly understood when they post a question. Ken learned that you have to be very specific if you don't want to confuse the heck out of your daughter. This grandmother wasn't very happy when her grandkid shared her attempt to figure out emojis. Of course, grandma has a nice way of being both sarcastic and loving at the same time with her reply.